Beautybar.com and Allure magazine have launched their first Sample Society box! This collaboration of beauty giants teamed up to create the next big thing in beauty subscription programs. 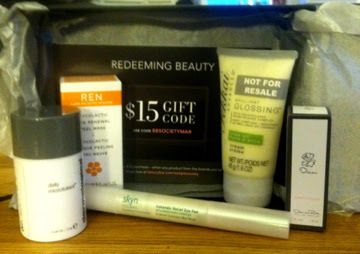 You pay $15 a month to receive a box of five deluxe size samples, a $15 off promo code for any purchases at Beauty Bar, a subscription to Allure magazine, and a mini booklet with beauty tips that coincide with the samples sent. $15 gift code to use at Beauty Bar. What a great selection of skin care items, and the sizes will last me a long time. I love that there's enough to really be able to experience the product for a while before committing to a full size. A girl's gotta have options! Thanks Sample Society for prompt shipping, great samples, and the tips to get the best use of my goodies! i already have a subscription to allure because it's such an amazing magazine! 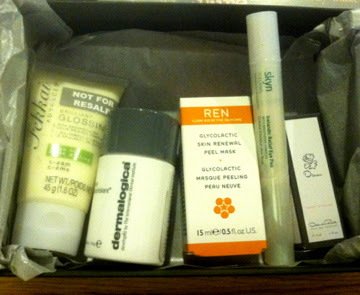 this looks a lot more appealing to me than birchbox. i may just have to check this out! This is nice. Love how there are coming up with so many of these sample boxes. Now more to choose from.